The solution is simple to Downgrade Windows 10 to Windows 7 or 8.1 or uninstall it when you have correct upgraded from Windows-7 or Windows 8.1 / 8! See: Upgrade Windows 7 or 8.1 to Windows 10! if not yor must install Windows-7 or 8.1 with a standard installations DVD on same partition, over the Windows 10 installation. Please start the Recovery in Windows-10 open the Start menu (Windows-Logo key) and select Settings. Back up your files before you begin reinstalling Windows 10 if possible, even if you're reinstalling Windows on a hard disk partition, and you have personal files on a separate partition. For example, if you have encrypted files, you might not be able to access them after reinstalling Windows. A custom installation replaces the current version of Windows 10 and all personal files. (Image-1) Downgrade Windows 10 to Windows 7 or 8.1! If Windows 10 is able to run, you can reinstall Windows 10 using Recovery in Control Panel, under Advanced recovery methods. This method reinstalls Windows 10, either from a recovery image provided by your computer manufacturer, or from the original Windows 10 installation files. You need to reinstall all of the programs that you added, and restore all of your files from a backup. 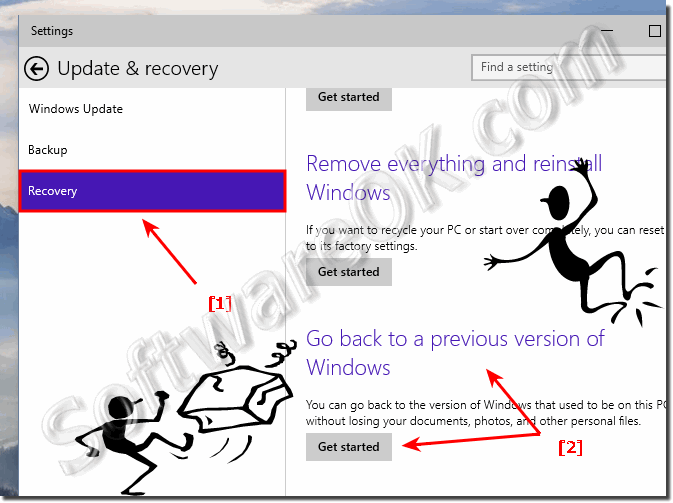 (Image-2) Downgrade Windows 10 and uninstall it! Installing your previous operating system will delete your Windows 10 programs files, and settings. You should back up any files and settings you want to keep so that you can restore them after the installation. You must manually reinstall your programs when the installation is done. If you are running a multiboot system parallel to Windows 10, you might be able to safely delete or reformat the Windows 10 partition and reclaim that space for use with the earlier version of Windows. For more information, see Uninstall Windows 10 on a multiboot system. Windows-10 - FAQ-111: Downgrade Windows 10 to Windows 7 or 8.1, can I uninstall it? Windows 10 back to 8.1?